If you're like me and are giving up desserts for Lent, you have two days to stuff your face enjoy a dessert or two before it begins. Today, I offer up my Monster Cookie recipe. I can't believe I haven't shared it with you before. It's one of my very favorite cookie recipes. Just take a look at the ingredients- it's perfect for Fat Tuesday (wink wink). That may have something to do with why they're so good. I most often make these with raisins instead of chocolate (chips or M&Ms). Because, you know, they're healthier that way. This recipe makes a lot of cookies. I've never counted them, but one recipe makes four cookie sheet trays of cookies and a large peanut butter container of cookie dough to freeze for later (pictured below). Also, when you pull them out of the oven, they'll seem very soft. As they cool, they firm up but stay chewy, almost fudge-y inside (one of the things I like best about them). In the bowl of your electric mixer, cream together the peanut butter, butter, brown sugar and white sugar. Add in eggs and vanilla and beat well. Add flour and baking soda and beat well. Begin to add the oats. I have to stop here at some point because my mixer bowl is too full. 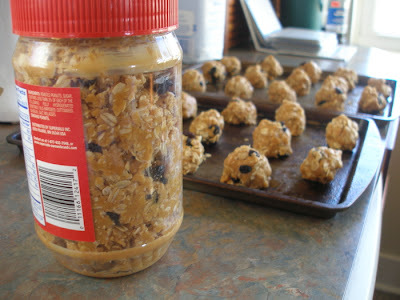 I then transfer the dough to a larger bowl, add the remaining oats, take off my rings and actually mix the dough by hand. Add the chocolate chips and M&Ms (or raisins) and stir well. Using a teaspoon (the kind you eat off of), scoop a heaping spoonful of dough and press it into something that resembles a ball with your fingers. Drop onto greased cookie sheets and bake at 350 degrees for 8-10 minutes or until they begin to brown lightly. 3 Cups of Peanut Butter???? Holy Cow! Yummy. I'll have to try these soon. 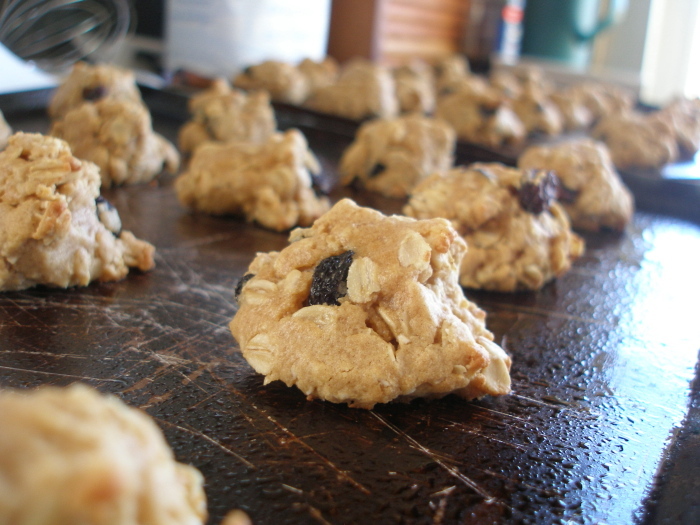 I make an oatmeal cookie with raisinette-type candy. That way I get the health benefits of the raisins AND the chocolate. Bet'cha that'd work with these. Reading this made me laugh. When I was in the Dominican Republic, I craved these cookies! My brother was coming to visit me & I asked my mom to send these cookies with him in his suitcase. She had never made them but looked up the recipe in the Mennonite cookbook by Esther Shank. She said she was just going along with the recipe & hadn't really read thru it. She kept having to get bigger & bigger bowls out & ended up with a roaster pan full of dough! She & I laugh & laugh about this. Thanks for reminding me of a funny memory. Sounds close to one of our recipes. Thanks for the inspiration. I've been wondering what kind of cookie to make. Wow! These are delicious. I was out of both chocolate chips and raisins, but they were still wonderful. yum - we love these! I don't usually put flour in mine - follow the Esther Shank recipe. And I make mine with raisins and chocolate chips together :) a little health, a little jolt. Now, question: you can freeze a container of cookie dough? and then you just thaw it and proceed as usual? This week I just froze lumps of drop cookie dough as an experiment. Usually I bake the whole batch right away and then freeze cookies. But I just ran out of energy before they were all baked. Yes! Just stick the whole container of packed cookie dough into the freezer. Thaw overnight in the fridge or on the counter and proceed as usual. Bringing the dough to almost room temperature makes it even easier, but it's not a requirement:-).